Allotment gardening is a popular hobby for many retirees. If you don’t have the space in your back garden, you can apply for an allotment through your local council if you are looking to indulge in a spot of gardening. 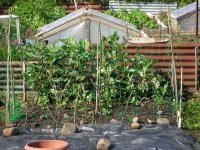 The standard allotment is approximately 250 square metres — which is pretty big, but you’d be surprised how quickly you can run out of space, so thinking ahead will help you make the best use of the space. Below, find some great gardening advice on how you can make the most of your allotment. By making a plan for your allotment, you can make sure that you’re using your space efficiently. Having a plan in mind will also give you a vision and a goal to work towards, and it will help you spot any potential problems further down the line. Consider how you will be able to access your plants; add pathways around your allotment by laying planks of wood down or by compacting the earth, which is sufficient to begin with until you are happy with the lay out of your plot. If you want to make your pathways permanent, consider using a membrane or some chipped wood. You should always rotate the crops you grow on your allotment. By rotating what you grow in each position, you can reduce the risk of soil-borne pests and diseases attacking your crops. Plan ahead and come up with a four-year plan for rotating your crops. Selecting climbers, like beans and peas, can save you space on the ground and help you to protect your more delicate plants from the elements. To keep the ground clear for other plants, use a frame, such as a trellis or wigwam, to encourage vertical growth in your climbers. Trellises can also be attached to taller objects to create extra ground space. Adding some height with climbers can also help to shield any vulnerable ground plants below them. With their hardier make-up and extra support from their frame, they can be planted around the borders of your plot to add protection to the plants in the middle. If you do this, be aware of which ground plants require high levels of sunlight, and avoid placing them in the shadow of your climbers. You can save some money by re-using household items in your allotment. Don’t throw away your old things; anything can be re-purposed; plastic sheeting can be used to create cloches, double-glazed windows can be used to create cold frames, and you will find many more possibilities if you look around your home. Investing in a good composter can help you to turn your bio-degradable waste into rich compost for your plants. By doing so, not only will you be saving money on shop-bought materials, but you will be helping to boost the environment by recycling your household waste. Look out for hedge trimmings or tree offcuts lying around as you can also use these as fuel for your compost. Although composters are not usually the most visually pleasing additions to your allotment, they can be installed in the least valued corner and decorated with other plants if need be. One thing that you will certainly have in common with your fellow allotment owners is a passion for gardening, so don’t think twice about asking your neighbours for some advice if you have a problem. Experienced gardeners can often have a lot of valuable advice for getting the most out of your allotment, and there is a good chance that somebody else will have faced your problem before. Don’t forget that tending to your plot is an excellent opportunity to make some like-minded friends, as well as benefiting from their knowledge. You can find more useful gardening tips on the Mantis UK website.